Successfully Added 7 Inch TFT LCD Car Monitor - 800x480 Native Resolution, HDMI + VGA Video Inputs, 360 Degree Rotating Stand to your Shopping Cart. 7 Inch TFT LCD Color Monitor with VGA & HDMI video inputs, remote control and stand that offers 360 degree rotation. 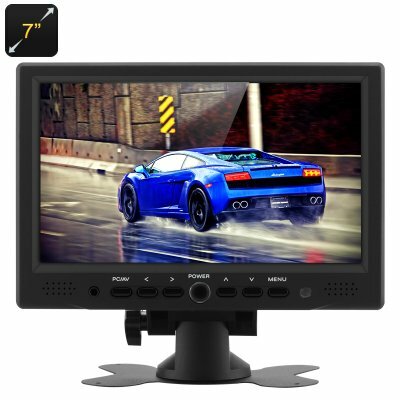 This 7 inch TFT LCD monitor is suitable for use in your home or car and has HDMI, AV and VGA support letting you hook it up to a rearview parking camera, DVD player or even a games consol for the ultimate in car entertainment when you’re on the go. Mounted on your dashboard it can be used as a rearview camera monitor or as a pure entertainment device that will make long car journeys fun, entertain the kids on the school run or provide enjoyment on a rainy camping trip away, this 7 inch monitor with 800x480 native resolution and full HD input support lets you do it all with ease. With a thin film transfer (TFT), LCD you can benefit from the ultimate combination of performance and value that brings outstanding quality and life to all it displays. The bracket that accompanies this product let you install it with ease on your dashboard or other suitable surface and provides 360 degree rotation of the screen when mounted. Coming with HFMI, VGA and AV cables and taking just a few moments to install make this the perfect accessory for that road trip this summer. This product is in stock now, we offer a 12 months warranty on all our products. Brought to you by the leader in electronic devices as well as wholesale in car entertainment systems, Chinavasion.